Smoke or grill your food - a barbecue to suit all tastes! 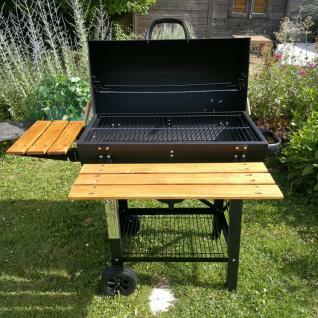 The Serge barbecue is an easy to use, quality product. Its grill base and hood are made of high quality steel coated with a heat-resistant matt paint. Lighting and cooking are quick, thanks to the 5 vents on this American-style smoker barbecue. They regulate the air flow, so that the charcoal doesn't burn too quick or engulf you in dense smoke. The air vents by the ash collector, on the sides of the hood (x2) and on the sides of the grill (x2) provide good air circulation. The charcoal is placed on an enamelled inner grate, leaving enough space below for the air vent to create a decent flow of oxygen. To make things easier, the ash collector vent can be opened and closed by an external lever. 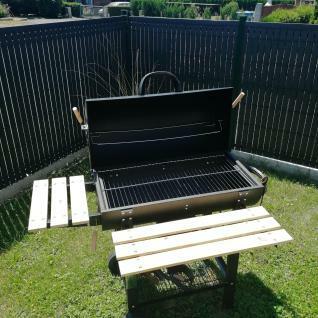 The Serge barbecue features a charcoal grate, a grill for cooking, a grate to keep food warm, and a grate on the stand, which acts as a shelf. Well thought out, it has two wooden shelves that provide two separate worktops. You can place dishes, condiments and utensils on them. The shelves fold down for easy storage. This barbecue is easy to move, thanks to its wheels and handle. Removing ash is simple thanks to the ash collector. Grills: 3 in total - Chrome heat guard, chrome cooking grill, enamelled charcoal grate. Air vents: 5 - 2 on each side of the grill and the hood, 1 on the ash collector level. Reinforced U base for increased stability. As lighting a barbecue can be a bit of a trial, the Alice's Garden catalogue has a chimney starter designed for charcoal barbecues as well as a utensil set designed for barbecues and griddles (Not included with the barbecue). 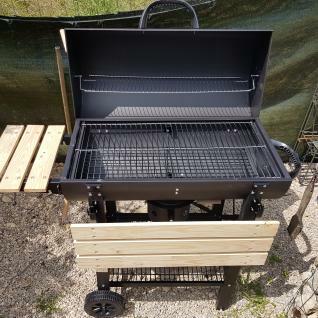 Entire barbecue: L114xW75xH98cm with fold-down shelves - L94xW52xH98cm when shelves are folded down.